Click here to purchase the paperback version. This product is downloadable as both an ePub and Mobi file. eBooks are not available as PDFs and are not printable. Click here for more information on how to download a book to your compatible device. Dogs who suffer from SA are truly panicked about being home alone: they may soil the house, eat the window molding, howl in misery all day, and/or pant, shake, and drool entire lakes of saliva. The good news is that this serious and frustrating problem has a very high treatment success. There is no instant cure, but if you follow the recommended training schedule to the letter, most cases are resolved in 6-8 weeks. I’ll Be Home Soon also distinguishes between dogs with SA and dogs who merely misbehave, and then provides a clear, step-by-step behavior modification program to keep your dog happy and your house safe while you’re away. A basic that should be in every expert’s library, this booklet is essential to send home with clients to ensure compliance and consistency with step-by-step desensitization and counter conditioning programs. Strongly recommended for any owner who wants their currently anxious dog to be comfortable, happy and quiet when left home alone. Also great for owners looking to prevent SA from the start. Help your clients address this common behavioral issue with this clear and concise explanation of desensitization and counter classical conditioning. Research has shown that medication is not effective without concurrent behavior modification. We all know that SA is prevalent in rescued dogs who have gone from a busy shelter to being alone in a new home. Although we don’t know whether dogs were surrendered with SA or developed it after leaving their previous home, we do know what to do about it. Let I’ll Be Home Soon increase the chance of a successful placement by preventing or treating SA right from the start. 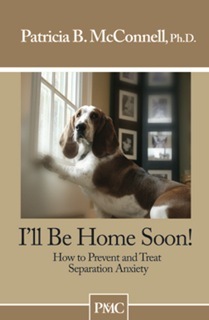 “An excellent resource for anyone who has ever experienced a dog with Separation Anxiety. "This little booklet saved both my life and the life of my Weimaraner, Misty. glass window, badly lacerating herself in the process." difficult problem. It was fairly easy to incorporate the training into our hectic household. Click the cover to Look Inside!